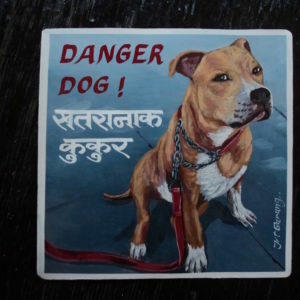 View cart “Gubby the Pit Bull by Baba” has been added to your cart. 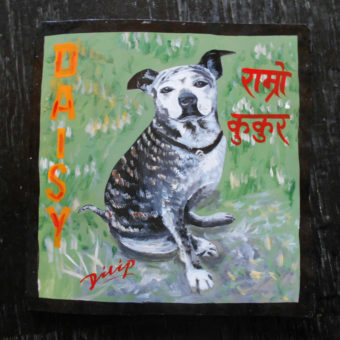 Daisy the Pit Bull Pug mix hand painted on metal by the sign painter Dilip Niroj is charmingly in a field of daisies. Her brindle fur is very striking. Daisy is a 3 legged dog. 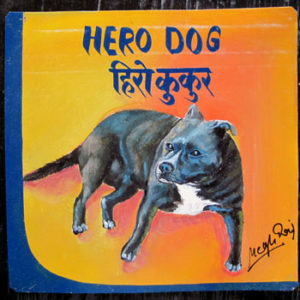 Dilip Niroj hand painted this Heroic Pit Bull named Domino on metal. Domino is a true hero that rescued his owner in a fire. This portrait has gone viral on the Tumblr site under Weird Friends. 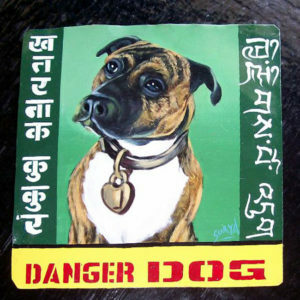 This folk art portrait of Evie the Staffordshire Terrier (that’s what they call Pit Bulls in Australia) is lovely against the green backdrop. 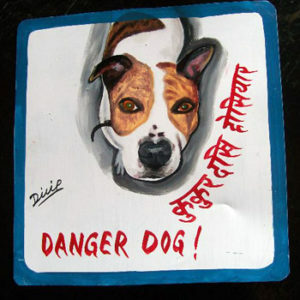 She was hand painted on metal in Nepal by the sign painter Dilip Niroj. 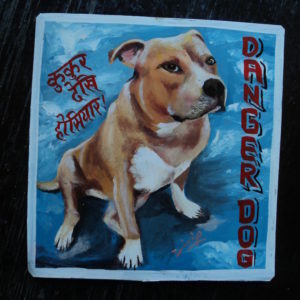 This Pit Bull makes a classic Danger Dog with her prominent tongue. 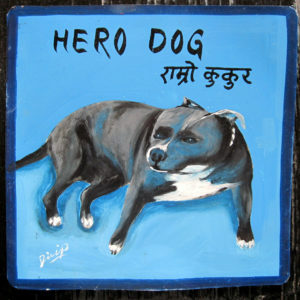 This pit bull/greyhound mix is hand painted by Hari Prasad. 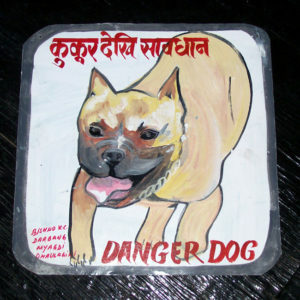 The always wonderful Baba hand painted this portrait of Gubby the pit bull with 3 languages… lettering in Tibetan (along the right hand side of the painting), in Nepali (along the right hand side) and English (at the bottom!). Domino is a true Hero Dog. He saved his young mistress from a house fire by scratching at her door and barking until she got out. Domino is a handsome boy in this portrait by Megh Raj Thapa as he lounges in a golden halo. Jake was a favorite neighborhood Pit Bull that charmed everyone he met. This portrait by Dilip Niroj captures completely his cute freckled nose and masculine face. 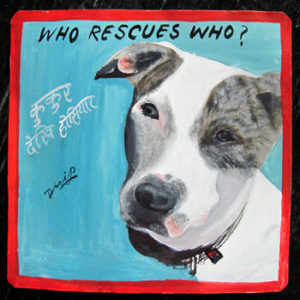 Ram Mohan Patel hand painted this rather structured portrait of a pit bull puppy named Lasko. This one is an odd size as it is !5′ by 12′. 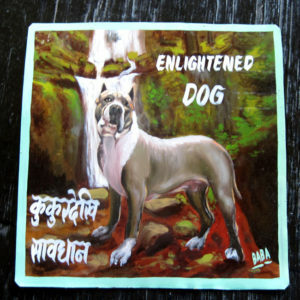 Dilip Niroj hand painted this portrait of Lina the Pit Bull. Lina was rescued through the No Kill Los Angeles organization whose slogan is “Who Rescued Who”? 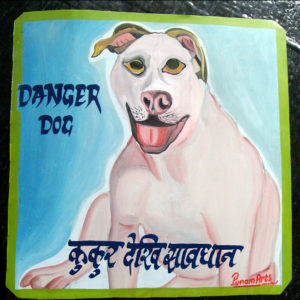 The lovely Lola is a perfect example of an ‘art brut’ portrait of a pit bull. 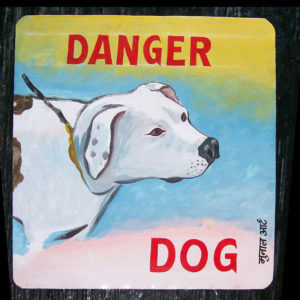 This is a classic Danger Dog sign. 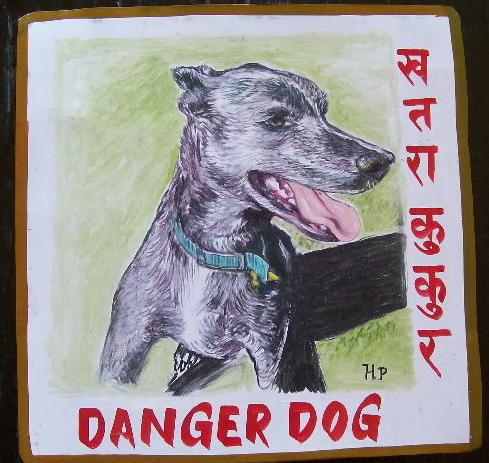 This portait of Pinky is by Jit Gurung. Pinky is the artist Larry Bell’s dog. The devengari script in the lower right is the artist’s signature (Munal Arts). Rudy is happy and pretty with her sky blue background. It is amazing to me that two artists can take the same image and come up with such different results. 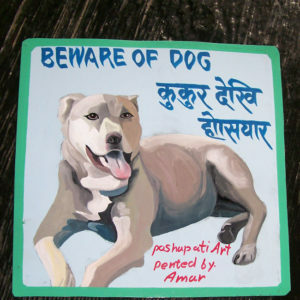 Amar’s work is subtle. ‘Pented by Amar’. Maple is a Pit Bull Terrier rescue dog from Oregon. As painted by Baba, Maple enjoys the waterfalls and seems happy with her new home. 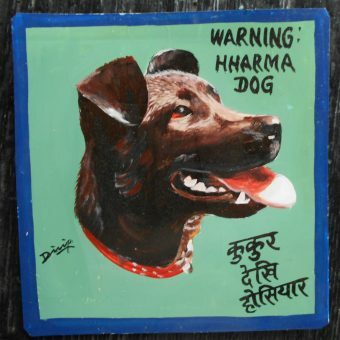 This is one of two paintings I commissioned in the small town of Darbang. 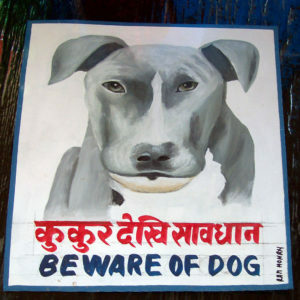 Bishnu the signboard artist was leaving the very next day for a 3 year contract in Saudi Arabia. This one has a bit of damage on the nose and ear, but is still lovely.